This one’s a real time saver. While writing tutorials, I used to do a screenshot, and paste image into an image editor to get all the column and row headings into an image. This requires a lot of work, such as moving and cropping the image. 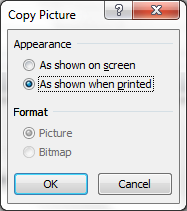 Now, I can just copy from Excel and paste into an image file into a image editor with the column headings directly. You can do this for both Excel 2003 and 2010. Make sure the Headings -> Print checkbox on the bottom right of the screenshot is checked. The solution for Excel 2007 is very similar to the solution for Excel 2010. Only that the window has moved to the Paste menu instead of the Copy menu. Repeat Excel 2010 – steps 1 and 2. 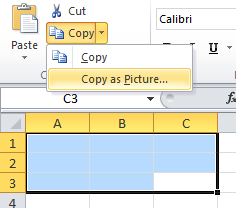 Click “Copy as Picture” You will now see the same menu as in Step 5 in the previous solution for Excel 2010. Repeat Excel 2010 – Step 5 and onward. This entry was posted in Excel, Excel 2007, Excel 2010, Work Smart. 😛 Excellent! Helped me a lot! Thanks! Thank you so much! It has been so difficult trying to figure out how to do this from other sources. This saved me so much time and energy.